This is a difficult blog post for me to write. It’s about the sled dogs of Whistler, B.C. who were slaughtered. My heart breaks whenever I think of this tragedy. Not only was this terrible act hard on the dogs who had to go through this terrible ordeal, the very idea that this could take place in Canada (or anywhere, for that matter) has taken it tolls on people, too. 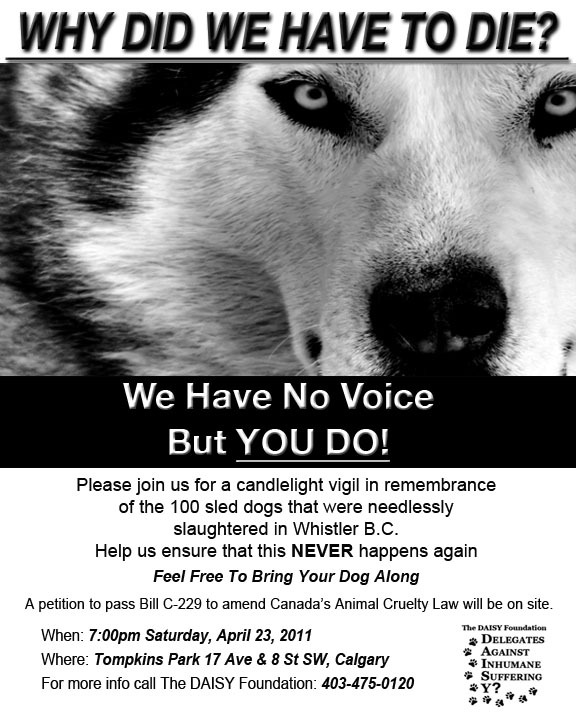 Tonight, Saturday, April 23, 2011, there will be a vigil in Calgary to honour the sled dogs who lost their lives. I urge you to show up if you can, or support the DAISY Foundation in some way. Do it to show that you, as a Canadian, deeply care for animal rights and want them enormously improved in our country.